Humanity faces an unprecedented challenge: to transition quickly to a carbon-free growth model, one that reduces the emissions causing climate change and could also lead to a more sustainable and equitable society. The world has embarked on its third energy transition: a relatively rapid shift in favour of low-carbon energy. Solar and wind are set to become the dominant and far more economical power sources as the world electrifies. 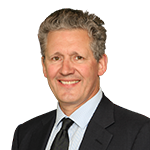 The implications are broad – for society, individuals and asset owners. There are new risks and opportunities for asset owners and private capital who will play a powerful role in this transition. Decarbonisation is now a mainstream investment priority. Investors must build the right framework and toolkit to manage successfully this shift, and fully grasp the impact of this transition at the macro, asset class and individual security level to meet their long-term objectives. This Energy 3.0 series seeks to set out an investment framework for asset owners embarking on this journey. The climate challenge is an existential threat. It is one of the greatest tests ever faced by humanity. According to the Intergovernmental Panel on Climate Change (IPCC), the UN body for assessing the science related to climate change, humans have until just 2030 to meaningfully reduce carbon emissions and, more broadly, should target limiting temperature rises to 1.5ºC, rather than 2ºC. Their report, published in October 2018, adds that the current pace of emissions gives us 12 years to ensure we are on the right path, with sufficient momentum, to avoid a climate catastrophe. More hopefully, the same report also reminded us that we now possess the technology to turn this around – and that turning it around could go hand in hand with ensuring a more sustainable and equitable society. In addition to technology we need willpower. This is proving difficult with even committed governments such as Germany and France set to miss the 2020 emission targets decided at the Paris Agreement. It is incumbent on everyone, for the good of everyone, to rise to this challenge. Climate change is as old as the planet we call home. It forms part of the natural, slow oscillation of the world's ecological pendulum. Human development has been founded on a period of relatively benign climate conditions since the end of the last Ice Age, some 12,000 years ago. However, it is now widely recognised that industrialisation and rapid population growth have created an economic growth model where human activity has taken over from nature as the primary agent of climate change. This has pushed the planet beyond its ability to repair and regenerate the ecological systems on which all forms of life on Earth depend. 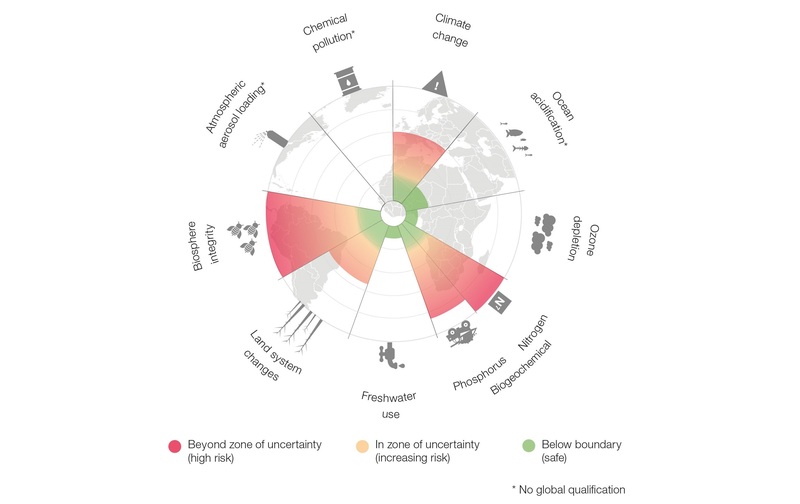 In 2009, scientists led by Rockström and Steffen identified nine planetary boundaries, such as ozone depletion and ocean acidification, that humans must remain within to survive. The current environmentally unsustainable economic model has the potential to breach these boundaries, with a fundamental impact on Earth’s ability to maintain its life-supporting balance. Many of the boundaries are inter-related but the pivotal issue is man-made global warming: the long-term rise in the average temperature of the Earth’s climate system attributed to rising carbon emissions. The challenge for humankind is to manage a transition to a carbon-free growth model, within a short timeframe, that can reduce the emissions that cause climate change. Done effectively, an energy transition to renewable sources could continue to improve living standards in the developed world and accommodate the ambitions of developing world populations to catch up. A fundamental energy transition is not without precedent. Previous transitions of primary energy sources from wood to coal and then to oil and gas have been instrumental in driving economic growth while offering higher levels of energy intensity. 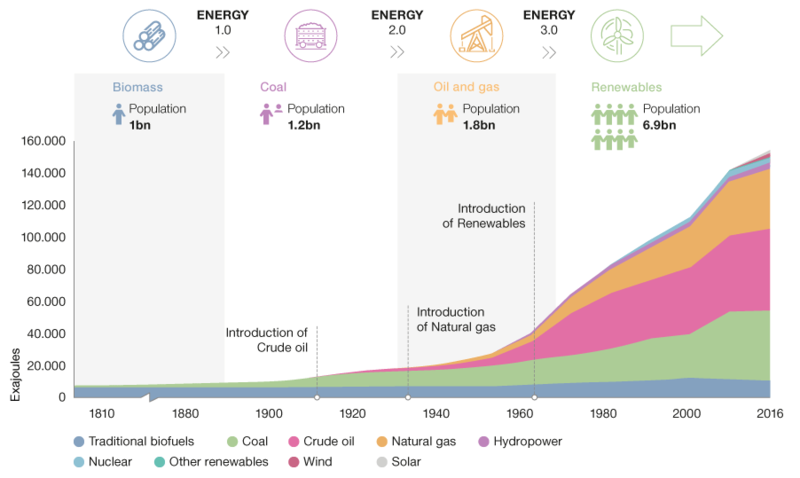 Source: Energy Production and Changing Energy Source by Hannah Richie and Max Roser, www.ourworldindata.org, August 2018. For the first time in human history, environmental protection – not cost or energy density – is the impetus behind a shift of our energy mix to more renewable sources. Moreover, there are numerous opportunities to invest in this transition – and to align portfolios towards positive financial and environmental outcomes. Governments have a key role to play. However, they need to pick a very narrow path which can foster innovation and ensure that the right incentives are in place to incubate low-carbon industries. While seeking to change consumer behaviour, governments will need to find ways to limit the tax increases and threats to jobs that have caused significant populist uprisings in France and Middle America. In Western Europe on successive weekends we have seen assertive climate change protests in London and anti-fuel price hike blockades in France. These events demonstrate the acute political risk on both sides. Broadly, governments do not have the financial firepower to pay for this transition and they do not have the political goodwill to afford the social cost. They need to achieve a ‘just transition’ which will not place the cost burden of the energy transition on those who can least afford it. With this political backdrop, it becomes increasingly clear that the private sector, in the form of technological innovators on one side and asset owners on the other, need to drive this transition forward. Governments and regulators will be part of the solution, but private capital needs to be directed with urgency towards the corporates, the industries and the organisations that can enable technological progress and behavioural change. New and more cost-effective technology has brought us to a point where solar and wind energy are often cheaper than old primary energy sources, notably nuclear and coal. Increasingly the near-term economics of these proven technologies support the ecological and moral imperative to push decarbonisation further, faster. Prices clearly have further to fall, reinforcing the competitiveness of renewable energy power sources. As American physicist Robert Muller observed, ‘if it isn’t profitable it isn’t sustainable’. Nuclear is no longer profitable without government subsidy; solar and wind no longer require public support. Electricity produced by solar and wind is now cheaper on average than coal. By 2024, the economics of solar and wind will widen the gap with coal and are forecast to be cheaper than natural gas. In 2000 solar and wind accounted for just 0.2% of the world’s power generation mix. This had risen to 2% by 2012 and to 7% in 2017. By that point renewables accounted for almost two thirds of net new global energy capacity, with demand growth coming principally from Asia. As hydrocarbon-based energy supplies are decommissioned, renewables are forecast to account for more than 100% of net new global energy capacity by 2020. At 7% of power generation, solar and wind are now above critical mass which we consider to be a 5% market share. If we look back at the two previous energy transitions, it took approximately 50 years for the new entrant (first coal, then oil) to go from 5% to around 50% of power generation. For coal this was from 1850 to 1900 and oil’s growth came between 1920 and 1970. In both instances, the preferred mode of mass transportation of people and goods was a major driver of rapid growth for each energy source: coal for railways and then oil with road transport. For clarity, the first two energy transitions are based on changes in market share of primary energy (which refers to energy before human intervention). The third transition refers to the market share of sources used for power generation (or electricity). Although inconsistent, the comparison provides an informative historical template. The latter approach is more relevant due to the rapid electrification of the global economy; electrification (of transport and heating from renewable sources) will help power generation become the largest component of primary energy usage. Electric vehicle (EV) production is on the cusp of a step change in 2019-20, as key auto incumbents are moving beyond the internal combustion engine. China leads this transformation, now producing over 50% of EVs worldwide. Established producers are putting the brakes on vast sums of capital that until recently had been invested in internal combustion technology rather than in EV growth. Now, as evidenced by the number of new EV model launches scheduled for 2019 and 2020, there is wide acceptance in the industry that the electrification of car fleets is going to proceed rapidly. China under President Xi is firmly committed to becoming a leader in renewable energy. The ‘Beautiful China’ policy was announced at the 19th National Congress meeting of the Communist Party of China in October 2017. Moreover, renewable energy and electronic vehicles were referenced in the ‘Made in China 2025’ policy document as two of ten technological priority areas. The impact of this policy shift has been remarkable. In 2017 China alone was responsible for 40% of the world’s renewable energy capacity growth and has already surpassed its 2020 solar capacity target as set out in the 13th five-year plan. The International Energy Agency (IEA), a global energy authority, expects China to exceed its wind power generation target in 2019. While China remains heavily reliant on fossil fuels – particularly coal which saw 39 GW of new installed capacity in 2017, ahead of wind with 20 GW but behind solar with 53 GW – the previously overwhelming focus on industrial growth over the environment is undoubtedly shifting. Air pollution, environmental damage and their attendant risks to the health of the population had become so bad in key urban areas that conditions threatened to damage the ruling Chinese Communist Party’s legitimacy. Asset owners are powerful, long-term actors. Globally, pension funds account for more than US$ 41 trillion* of assets and the international mutual fund market is even larger at US $53 trillion**. Sovereign wealth funds and pension funds have been active in developing strategies that shift asset allocation to address some of these longer-term systemic issues. They need assets that generate returns to meet their long-term liabilities and these returns are increasingly threatened by climate change-related (and, indeed, other ESG) issues. In response, unprecedented numbers of pension funds, globally, have developed ESG polices and expect ESG to be integrated throughout the investment process. Most of the activity has been voluntary but regulators are increasingly stepping in to set a minimum standard that explicitly addresses the responsibility of asset owners to consider all risks, including ESG. An investment manager has a fiduciary responsibility to maintain and grow the wealth of its clients. Today, any investment approach which fails to incorporate sustainability-related factors, such as climatechange considerations, is likely to fall short of that responsibility. Engaging with regulators and policy makers to participate in the development of regulations that will help steer our sustainable investing future. Acting as responsible stewards to promote best sustainable practice within and by public and private investee entities. Re-assessing the risk/reward profile of investment portfolios to better capture the challenges and opportunities created by decarbonisation. Asset markets will of course move to discount tomorrow’s world today. After a number of false dawns, our decarbonised future is increasingly being recognised in today’s asset values. It would be all too easy to adopt an Orwellian ‘carbon bad, renewables good’ approach to investment decision making. The investment journey towards decarbonised portfolios requires an ability to understand the nuanced impact of the transition at the macro, asset class and security level. 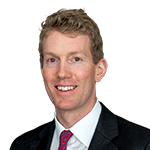 Some carbon-dependent assets will still have a role to play in the near term and their valuations must reflect that. Equally, renewable assets will not be exempt from periods of mania and associated valuations as green bubbles form and burst. This Energy 3.0 series proposes a decision-making investment framework which recognises materiality, the time scale over which assets are likely to be affected and the factors that influence asset pricing. New thinking and new approaches are vital if investors are to obtain positive outcomes within their investment opportunity set. The climate challenge, the energy transition and the role investors can play in redirecting capital towards low-carbon technologies and behaviours are all unprecedented. None of them are insurmountable, provided all parties act now – and for investors this means rapid reassessment and action on their weightings towards carbon and decarbonisation.